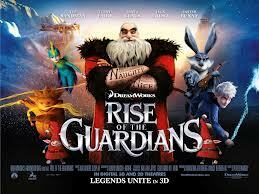 Rise of the Guardians one of the best movie that I have seen. There is the Tooth Fairy, the Easter Bunny, Sandman, Jack Frost and Santa Cauls and those are all the characters accepted Pitch the bady. Pitches power is nightmares. Do you get Nightmares? There is a giant globe with little yellow lights on the globe and they are the children that believe in them. The tooth fairy coulets teeth, the easter bunny dalivers easter eggsand sandman makes good dreams not bad ones like pitch. Jack frost makes snowballs and ice and last but not least santa claus gives out presents on christmas night. 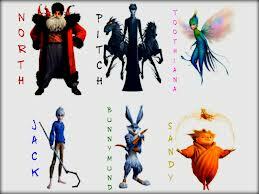 Witch one of these characters do you like? My Favourite character is the easter bunny. The reason I like him is because he is the funniest character in the movie. He is also the fastest. all of you who just read my story you should watch it yourself? Great writing Levi! Darius and I went to watch that the first day it came out. It was such a wonderful movie with great animations. 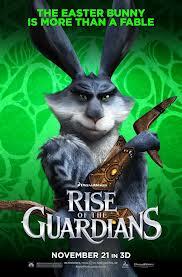 My favourite part was when Jack Frost could finally be seen and I thought the Easter Bunny was pretty funny too. I hope you had a wonderful holiday and that you're excited to start school on Monday.